Sony Ericsson have done it again - and not because they were running out of room. What was it again? About good things and small packages? Sorry, Xperia Arc. Nothing personal. The Xperia mini is back with a bang, and in its best shape. The compact body was the unique selling point of the original mini. Sony Ericsson have apparently been busy ticking the rest of the boxes. The sequel is nearly the same size but has more to show for it. The Xperia mini is a textbook example of an upgrade. It inherits everything important from the superior members of the Xperia lineup. 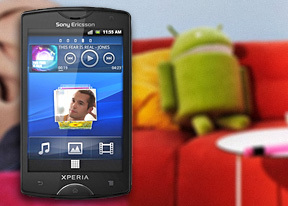 With a Reality display, Snapdragon core and the latest Android 2.3 Gingerbread, the Xperia mini offers the complete Android experience. A feature-rich phone that looks good and doesn't charge a fortune: the price at launch is less than €200. It's not an exaggeration to say the Xperia mini is the best smartphone for its size. It may as well be one of the best performers for its price too. It looks ready to build on the success of its predecessor but its appeal will certainly extend beyond the brand's loyal base. The Sony Ericsson Xperia mini will not shrink in the face of competition. It will stand tall and say "Bring it on". The HTC Wildfire S costs about the same but cannot quite match the 1GHz, Gingerbread-powered and HD video enabled Xperia mini. What the Wildfire S has in its favor is HTC Sense, feature-rich and full of eye-candy. Custom skins for Android don't get any better than that. The Nokia C6-01 is a Symbian alternative with a beautiful 3.2" ClearBlack display and as of recently running Symbian Anna. The AMOLED screen has higher resolution and the metal body wins extra points too. Add HD video recording, USB On-the-go, DivX and XviD and TV Out to the free of charge SatNav solution and you have a pretty good mix. The Froyo-running LG Optimus Me and the Samsung Galaxy Mini (updated to Gingerbread) are a lot cheaper but come with poor low-res screens, less capable hardware and low-end features. They wouldn't make much sense as alternatives of even the original Xperia X10 mini. As to the original Xperia X10 mini, we guess it can safely call it a day. The ultra-compact class is in safe hands and stays in the family. Things are looking good for Sony Ericsson in the midrange - and the Xperia mini is a small phone that can make a big difference. It doesn't want to be a flagship when it grows up. Good. It can be anything it wants.